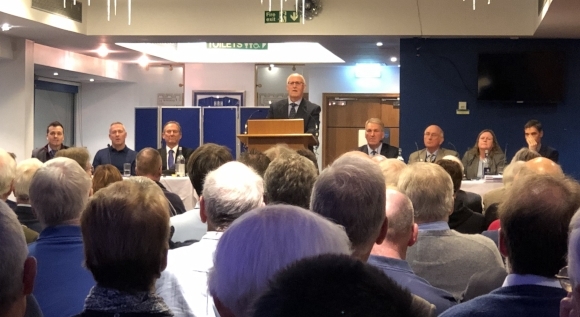 Blues boss Paul Lambert called for everyone at Town to pull in the same direction at tonight’s PLC AGM in the Sir Bobby Robson Suite at Portman Road. At a sometimes frosty meeting - towards owner Marcus Evans and the club rather than Lambert who was warmly welcomed by shareholders and praised on a number of occasions - the new boss made his call for unity after answering questions along with MD Ian Milne and Lee O’Neill, who confirmed he is taking on a role as general manager of football operations. “This is my first time meeting you guys and I sense a little bit of animosity, a little bit towards the club and the club towards you. I sense it and can feel it,” Lambert said having asked PLC chairman Roger Finbow if he could make a concluding statement. “As I said before, at some stage that’s got to stop everybody’s got to be pulling in the same direction or we’re never going to have success. “The football club needs you, without a doubt it needs the fans, other working class people, we need everybody to be pulling the same way and hopefully things iron out and the club starts to [look up] rather than what’s happening at the minute. You can read TWTD’s live blog of the meeting on the Forum here. Yes we all need to start pulling in the same direction. Clear out of the dead wood is essential and needs to happen now, before its to late. Some animosity is to be expected when we are bottom of the league. Lambert is right though. We need the club to bring the fans back through ticket promotions, then invest in some decent players so winning football can return. Scrap the awful Magical Vegas deal and go back to being a proper community club. That's how we pull together. More wise and welcome words from Paul Lambert. Very commendable and it will be a long battle to bring everyone back onside. With such positivity and open enthusiasm it’s a pity Paul is not running the club. Hopefully we will see an upturn in fortunes on and off the field soon. PL's tenure might be a bit like the climate summit: Armageddon - the final battle between good and evil, with oblivion on the cards if we lose. I hope he's in it for the long haul. PL says all of the right things in my opinion. He's a good manager, with a decent track record, who finds himself with a mountain to climb - Everest, whilst blindfolded and with his hands tied. I can't think of another manager who I'd rather have in this situation. Our anonymous owner, Marcus Evans, and his reluctance to support this club is the problem. It's imperative we keep PL if/when we go down. Clearly understaable expressions of frustration and discontent from the 12-odd% of independent shareholders represented at last night’s AGM. Summarised perhaps by the question: “what has Marcus Evans done for us?”. Moderate view would be that he rescued the club from near oblivion, has continued to invest annually to keep us afloat, has higher ambitions for the club, including investing in our academy as a means of achieving them. Negative views suggest that being a remote, largely silent, owner creates an immediate disconnect with supporters; his complex set of businesses with cross transfer of tax and investment liabilities etc; poor decision making regarding choice of managers; insufficient investment on the quality of players required to compete effectively timely in an ever more competitive C’ship. Etc, etc. And into this history and conflict has stepped PL - and I detect that he’s genuinely shocked at the underlying animosity and apathy towards the owner and - more importantly - the club. And I don’t think, on face value, he quite understands it. For him, we remain a great club, and he sees the challenge ahead of rebuilding across all - on and off field - areas of the club. The internal restructuring will hopefully help with that. But the biggest change must come from Marcus Evans because, in the final analysis, where we have come from, and where we are now, ultimately comes down to him. Good luck PL. COYB! herfie, you say Evans invests in the Acadamy, but they dont filter through, they fade away or if any good go elswhere.I hink its frustrating when we keep hearing that our youth is the future. adding to my previous post, the young players will probably find it less attractive to be in the academy of a Lge 1 team too if thats where we end up . Evans shows his contempt yet again by his absence ,my opinion. Far to busy to bother about a football club, or what we have to say. Wouldnt want to be asked serious questions, let the ''monkey'' earn his nuts and waffle along ,we'll have a chuckle about it on the phone tomorrow ! I think employing Hurst badly backfired for many reasons. But with particular reference to our academy graduates, he made his most damning decision, to send our a crop of youngsters that were either just breaking into the senior squad/ team or were already playing first team football. In Lambert I see the complete opposite approach. I can see the likes of Nydam, Emmanuel, etc returning to Town in January ( if it’s possible), and being part of our first team squad. They’re certainly better than Hursts imports. Furthermore, IF we are relegated, and we can keep hold of Paul Lambert, I think we will see a very young Town side take to League One, and do very well with a few senior players in amongst them. "And the club towards you". A key part of what Paul said. As a good number said afterwards last night the club listening to and relating to what supporters say is key. There is a huge amount of mistrust which is not helped by Ian Milne's sidestepping of many things that people consider important. Paul also said that the suggestion of reducing prices, this season, to encourage bigger crowds was good, and that the bigger crowds are important. So lets see how Mr Milne reacts to that, hopefully he will take it on board. The meeting was extremely positive to PL, not least because he seems to be the first person to be on the supporters side for some while. Remember all the shareholders put their hands in their pockets at a time when we all thought it couldn't get any worse. Obviously we were wrong about that but I firmly believe that we all want to see ITFC recover, back to being a respected club for both footballing and non footballing reasons. Herfie , what a comprehensive summation & extremely balanced all round narrative . Thanks for the utter realism and positive look to how we deal with the future .There will be one - and PL can be a great influence in every aspect . At last we've now got a very good Manager who understands our Club, but he'll need some serious financial backing in January. Unless Marcus Evans stops messing around with our Club and realises that to compete in this Division there has to be proper investment, we will definitely be watching League One football next year. Sadly the damage may already have been done by January, due to Hurst's poor signings during his short tenure. But this guy is a leader. He's incisive and perceptive, and most importantly he's prepared to act on what he sees. I'm on board. For the long term. timspencero...I could have written that myself. timspencero , not a legend yet,but certainly could be potentially ,however he needs Evans to back him, and that may be the stumbling block , i just hope Evans has seen the light, realises at last he has a good manager that is getting everyone on side, and could bring back the good times,AND go's the extra mile and backs him with finance to carry out much needed strengthening of squad . Marcus Evans has made some decisions that turned out to be shockingly bad ... or should the shockingly be SHOCKINGLY ...... but he has also (by all signs so far) made a cracking good one in bringing in Paul Lambert ... thank you Marcus for the hope this brings. Please now be SURE to give PL the £10mill you apparently promised him in January and it will be repaid for sure with Championship survival. Results of late have generally been worse than the performances - we certainly played Reading off the field (the only game I saw live) and we are obviously creating goals ... how else would we be scoring them! Again people on here suggesting ITFC is a Marcus Evans tax solution, just please will the people who actually believe this, please for love of God, explain how this works. It just seems utterly bizarre that anyone can arithmetically believe that by writing of a debt against tax it can in anyway make either an individual or company any better off. I would love to know what the occupations of of those of this belief are.